Galaxy Tab 7.7 is one of the best Android tablets out there, especially for the one that is always on the move. It is being offered by Verizon network in the US. For the ones that love inputting lot of text on their tablets, Samsung offers a full size keyboard dock that has excellent built quality – at par with the Samsung smartphones. While it is not made from Aluminum like the tablet, it feels solid in hands. The keyboard is easy to use – you need not download any software and there are no options to configure, chiefly due to the fact that it is especially made for the Tab 7.7. Just slip your Samsung tablet into the 30 pin jack and you are ready to go. 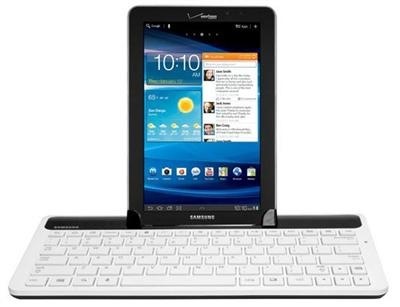 There are three ports offered by the keyboard – 30 pin Samsung power port, headphone jack (that does the double duty of speaker jack) and another 30 pin Samsung port where the tablet sits. Typing experience is amazing and size of the keys were comfortable enough to our digits. You can get it for 80 dollars from the Verizon store or Amazon. We highly recommend buying it. Find out differences between Galaxy tab Plus and 7.7 tablets.